Sellers, listen up! You’ve probably heard Realtors state over the years “This is the Best Time to Buy” or “This is the Best Time to Sell”. There may have been truth to that, but never more so than right now. 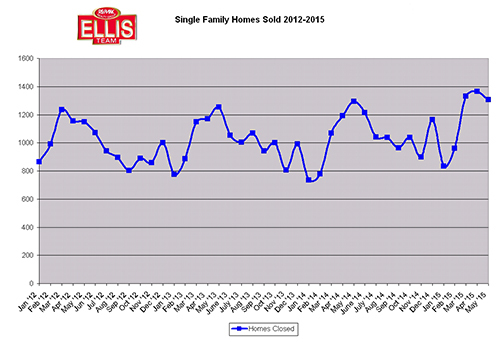 Inventory levels have dropped to their lowest level since we began tracking inventory with a new system in 2012. We’re down to 4,712 single family homes on the market in Lee County and this brings us to a new low in Months Supply of Inventory, down to just 4.3 months. 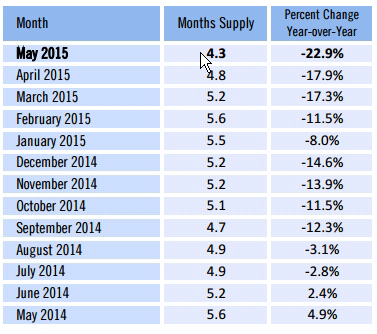 That is a 22.9% drop in months supply from last year and a 14.9% drop in number of listings compared to last year. If I were to tell you new pending sales were up 5.6% and May closings were up 1.2% you might wonder how that could be if inventory levels were falling drastically. It’s all true. Sales are out-pacing new listings. Closings are up and it’s driving the supply of available inventory down. Median sale prices are up 11.4% in May while average sale prices fell by .8%. This tells us that the bottom of the market is coming up which is pushing the median price up. The big sales didn’t occur last month so it didn’t pull the average up at the same rate. Some sellers are getting nervous and wondering if now is the best time to sell while others see a nice upswing and want the market to go up even more so they’re waiting to sell. From a statistical standpoint, the best time to sell is when you have more buyers than sellers, and this market definitely qualifies for that. We can’t tell you how much further the market will go up, how fast, or for how long. What we can tell you is demand is larger than supply and it’s always more fun to sell in those kinds of markets. If you’ve ever tried to sell a home when supply was much greater than demand you know that’s not near as much fun. We’d caution sellers not to overprice, even in a low supply market or you may miss it. Buyers will turn off at a certain point. Back in 2005 buyers turned off. Of course they were a different kind of buyer back then. We had speculators back then. What is different today is we have real buyers, real end users. That’s why we’re not concerned about a downturn like we were in 2005. When we hit that point prices may stagnate and supply and demand may level out. That doesn’t mean prices have to fall. It just means it won’t be as fun to be a seller as it is today. Today is big fun for a seller. Tomorrow may be good, just not big fun. If you’ve ever been to a sporting even and thought that game was good, but not as good as the best game I ever saw, it might be a little bit like that. If you’d like to check out available inventory, you can do so on our website at Leecountyonline.com You can also find out what your home is worth too. If you’re thinking about selling, now might be a good time to call us and we can discuss your options. 239-489-4042 We’re here today, tomorrow, or next year, but it might be more fun to talk today! Posted in Cape Coral, Cape Coral Real Estate, Fort Myers, Fort Myers Real Estate, Southwest Florida Real Estate.Tagged Months Supply of Inventory Dips Drastically.